E. Dakota: Happy Summer Solstice + Im back ! Happy Summer Solstice + Im back ! HI FRIENDS ! It has been a while, but I had a very long short month of class ( they weren't fooling when they called it an intensive ). Today is our official start to summer + the longest day of the year ( but if yesterday wasn't summer, I'm scared for what's ahead ). Soak up every minute of this natural light. 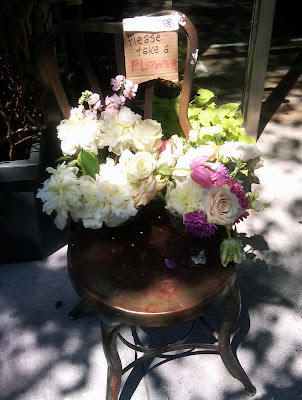 I was bustling down the street the other day and this rusty old chair + cardboard sign stopped me in my tracks. Free flowers ?! For me ???? I was so happy to pick out a white rose and smell it for the rest of my walk. What a thoughtful great way to get rid of your dying blooms + to get people to notice your shop ! Happy Monday.